Steamed veggies are great, but the one problem they have is that they require steam. The fastest, simplest way to achieve this is to boil water. In a pot with a steam basket. In a pot that happens to be dirty. Oh well, leftover pizza sounds good too. Just because one has been foiled by a sink full of dirty dishes does not mean one has to give up the dream of steamed vegetables. If the pot that is normally used for steaming may be otherwise indisposed, move on to another pot. 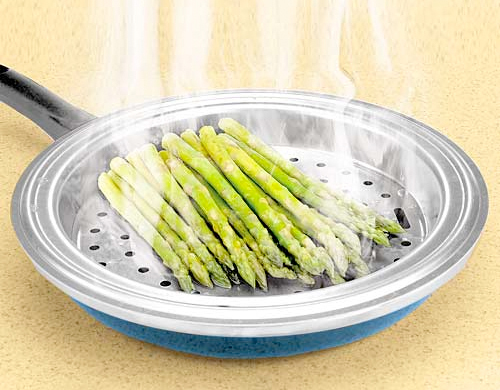 The Skillet Steamer is an aluminum steamer meant to be used in any 10-inch fry pan. Perfect for those times when a dirty pot stands between you and freshly steamed veggies. Unless of course, the fry pan is full of grease from cooking up a batch of burgers; which in that case you probably really could use a serving of veggies and might just have to eat them raw. It’s a pancake, it’s a waffle, it’s both!